In general, what comprises a dinosaur’s skull? The skull of a dinosaur is made up of the teeth and all the bones in the head. These bones can occur in pairs, on opposite sides of the head, or singly (usually around the middle plane of the skull). There are two major sections of the skull. The upper part, or cranium, contains the braincase, nostrils, upper jaw, and eye sockets. The other section is the lower jaw, which is made up of the right and left lower jaws (mandibles). Examples and locations of dinosaur skull bones include: the cheekbone (jugal), located below the eye opening (orbit); the postorbital, a small bone located behind the eye opening; and the lacrimal, a bone that separates the eye opening and the opening forward of the eye. There are several interesting details about dinosaur skulls. For example, there are more than 30 bones in the skull of a dinosaur. Most dinosaurs had unusually rigid joints between their skull bones called sutures (similar to sutures in a human skull). There were also kinetic skulls, such as the Allosaurus fragilis, in which several of the skull bones were joined but could still move, probably so they could stretch parts of the skull in order to gobble down extremely large chunks of meat. 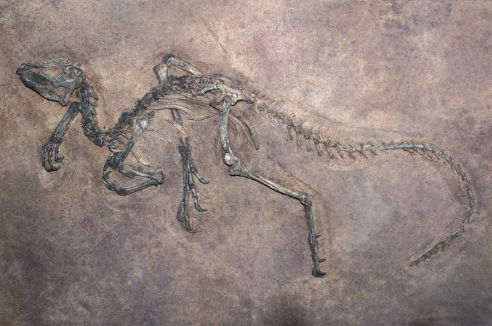 We often think of dinosaur fossils being discovered like this one, with just about all the pieces perfectly preserved. In most cases, though, only incomplete skeletons are found, for various reasons (iStock).